Serena Williams and Kei Nishikori headlined Tuesday's Day Session in Melbourne. The second day of the Australian Open in Melbourne once again proved itself as a showcase for tennis stars such as Serena Williams, Madison Keys and Kei Nishikori, and it also included the young and old of this international sport, from 16-year-old American Whitney Osuigwe to Ivo Karlovic of Croatia, who soon turns 40. The 23-time Grand Slam champion Williams of the United States began her record-tying quest for a 24th major with an easy 6-0, 6-2 victory over Germany’s Tatjana Maria in just 49 minutes. It was a perfectly contained opening-round win for the 37-year-old Williams, seeded 16th, who hit 22 winners against just 11 unforced errors. It was an overwhelming performance from the seven-time Australian Open champion. Maria served at just 13 percent in the opening set and committed 20 unforced errors in a first-round battle of moms. Williams outpointed Maria, 54-24. Next, Williams will face Eugenie Bouchard of Canada, ranked 79th, who advanced over Chinese wild card Shuai Peng, ranked 129th, 6-2, 6-1. Before Williams arrived to much fanfare on court at Rod Laver Arena, the No. 17 seed Keys won her opening-round match, needing just 71 minutes to beat Australian wild card Destanee Aiava, ranked 193rd, 6-2, 6-2. In making her 2019 debut, the American Keys finished with six service aces, won 81 percent (22 of 27) of her first-serve points and hit 24 winners while committing only 19 unforced errors. She broke Aiava four times in 15 opportunities and outpointed her 72-48. Other first-round winners on the women’s side: No. 7 seed Karolina Pliskova of the Czech Republic defeated Czech qualifier Karolina Muchova, 6-3, 6-2; No. 12 seed Elise Mertens of Belgium beat Anna Karolina Schmiedlova of Slovakia, 6-2, 7-5; No. 13 seed Anastasija Sevastova of Latvia won over Mona Barthel of Germany, 6-3, 6-1; No. 18 Garbiñe Muguruza of Spain defeated Saisai Zheng of China, 6-2, 6-3; and No. 21 seed Qiang Wang of China advanced over Fiona Ferro of France, 6-4, 6-3. Meanwhile, first-round men’s winners included the No. 8 seed Nishikori of Japan, who advanced when qualifier Kamil Majchrzak of Poland, ranked 176th, retired in the fifth set of their match after 2 hours and 48 minutes of play under sunny, 32º Celsius temperatures. Majchrzak won the first two sets by scores of 6-3 and 7-6 (6), before Nishikori rallied to win the next two sets 6-0 and 6-2. Nishikori was ahead 3-0 in the fifth set when his opponent retired. “I’m happy to be here; I hope I can have a good two weeks,” said Nishikori on court after his victory. He missed the 2018 Australian Open because of a wrist injury. Also, No. 11 seed Borna Coric of Croatia advanced over Steve Darcis of Belgium, 6-1, 6-4, 6-4; No. 12 Fabio Fognini of Italy moved on when his opponent, Jaume Munar of Spain, was forced to retire in the third set with the Italian leading 7-6 (3), 7-6 (7), 3-1; No. 15 seed Daniil Medvedev of Russia beat qualifier Lloyd Harris of South Africa, 6-1, 6-2, 6-1; and No. 29 seed Gilles Simon of France advanced over American qualifier Bjorn Fratangelo, 7-6 (2), 6-4, 6-2. Finally, it took slightly more than three hours to finish, but No. 69 Ivo Karlovic of Croatia, who at age 39 is oldest men’s player in the singles draw, survived his first-round match against No. 88 Hubert Hurkacz of Poland, 6-7 (5), 7-6 (5), 7-6 (3), 7-6 (5). Karlovic fired 39 service aces and hit 78 winners against the 21-year-old Hurkacz. Each player was broken just once. Following the fourth-set tie break, which Murray won 7-4, BBC5 Live’s David Law tweeted, “Whatever happens from here, over the last 10 minutes Andy Murray has turned this into an Andy Murray match. While Murray’s effort, which produced what “The Tennis Podcast” called “a rousing comeback in a match of unrivaled poignancy and significance” wasn’t quite enough for him to win, it provided everyone with hours of compelling drama. For now, Murray appears to be keeping his options open and hopes to play the final tournament of his career this summer at Wimbledon. 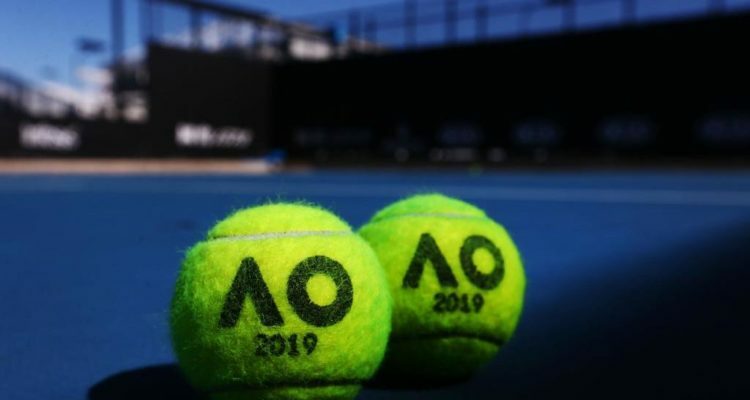 Alex de Minaur, one of 12 Australians in this year’s men’s singles draw, is trying to become the first Aussie to win the Australian Open title since Mark Edmonton in 1976. The last Australian man to adavance to the men’s singles final was Lleyton Hewitt, who lost to Marat Safin in 2005. The 19-year-old de Minaur, ranked No. 29, is fresh off winning the ATP 250 Sydney International last weekend. He won his first-round match over No. 103 Pedro Sousa of Portugal, 6-4, 7-5, 6-4, on Monday. “Every match, just making sure I go out there, compete, just give it my all. That’s pretty much all I can ask from myself,” de Minaur said recently. Meanwhile, Ashleigh Barty, the world No. 15, is Australia’s best hope for success in the women’s draw. The last Australian women’s champion was Chris O’Neil in 1978. Barty comes into Melbourne having beaten No. 1 Simona Halep in Sydney last week. She reached the finals before losing to No. 6 Petra Kvitova. Barty won on opening day over No. 66 Luksika Kumkhum of Thailand, 6-2, 6-2. “Australians are hungry for sport,” she explained after her win. “They love it. They’re addicted to it. I think at this time of the year it always floats around with tennis that they’re looking for an Australian player, in particular, to go deep and have a really good run. “Who needs two hips when you have an extra large heart?” – Courtney Nguyen (@FortyDeuceTwits), WTA Insider, commenting on Andy Murray, during his Monday night match against Roberto Bautista Agut. This entry was posted in Australian Open, Grand Slam and tagged Australian Open, Grand Slam, Melbourne.